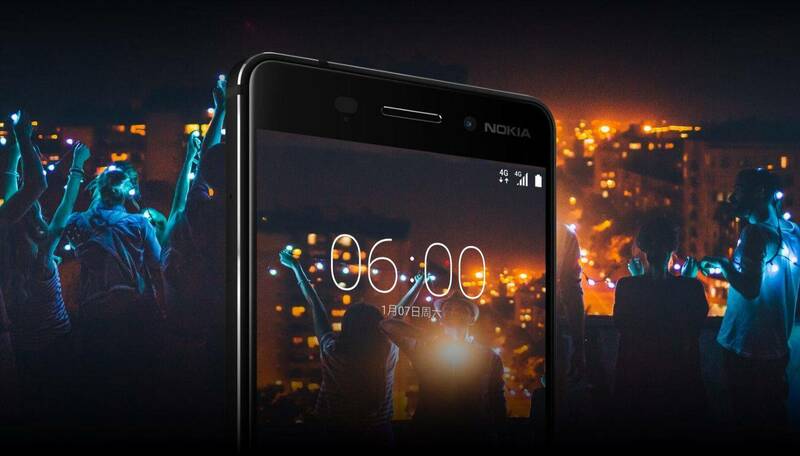 The Nokia 6 comes in Blue, Silver, Copper, Black and Matte Black. A charger and earphones are included in the box. Holding the phone gives you a solid and sturdy feel since it’s an Aluminium Unibody design with chamfered edges. The back is slippery and I recommend having a case (although the one drop that it suffered from the couch, there were hardly any noticeable scratches!). Considering its thickness and 169 gram weight, it isn’t the most compact of 5.5” phones out there and it’s not ergonomic for one handed use, especially If you plan to use it for longer durations. The power and volume buttons are on the right, 3.5mm jack at the top, charging port and dual Dolby Atmos speakers at the bottom, with the hybrid SIM slot is on the left-hand side. The capacitive fingerprint scanner at the bottom of the screen serves as a Home button as well and is flanked by the capacitive backlit Back and Recent apps buttons. The scanner isn’t the quickest but gets the job done. The rear camera with dual LED flash does protrude out a bit and is placed vertically, reminiscing of the Lumia series. Nokia branding is both at the front and back. The 5.5” IPS LCD screen is as reflective as a mirror and sometimes annoying since you have to keep changing your phone brightness levels in daylight - auto settings don’t help! Funnily enough, the notification LED is missing which the company says was taken out after a market research showing people don’t use it that often (you must be kidding!). The Snapdragon 430 CPU powering the phone along with 3GB of RAM can’t be called cutting-edge but the phone was unveiled early this year to be launched in most markets only now, making it look outdated already. There’s 32GB memory on board with expansion options up to 128GB. The phone has 4G VoLTE, Bluetooth 4.1, FM Radio, and NFC. HMD Global has promised OTA updates for a year which means it should at least get Android 8.0 Oreo later this year since it runs on Android Nougat 7.1 out of the box. Most Chinese manufacturers don’t promise updates and you see the difference in them once the app gets updated but start to lag and the phone slows down overall. Thankfully HMD has taken care of that. The UI is as close to stock Android and looks exactly like the Pixel/Google Now Launcher. There’s not too much bloatware and most of the pre installed apps can be removed. Long pressing on an app icon gives you shortcuts for that particular app. For example - long pressing the YouTube icon brings up trending, search and subscriptions options. There are a few gesture support options and other app shortcuts as well. The rear 16MP camera with f/2.0 captures good photos in daylight but is a little slow to focus and the app is a bit slow as well. Shutter speed could’ve been faster. Night photos will come out only average in good lighting conditions, else they are dark and hard to pick out any details. The front camera still clicks decent selfies, good enough for social media uploads. The video recording maxes out at 1080p or Full HD, no 4K support unfortunately! The advantage of the Nokia 6 lies in the audio output, due to the Dolby Atmos stereo speakers providing a rich multimedia experience. The audio quality from the speaker is loud and crisp. Some games like Asphalt Extreme & FIFA 17 do start off slowly especially, when both of them are running and one is in the background, the switching is slower than expected and sometimes the phone also gets warm though it cools down quickly as well. The 3000 mAh battery lasted for around 18 hours on average usage but less than 15 on heavy usage. 2 hours to a full charge thanks to the missing fast charging! Decent camera, good audio capability and regular updates on a stock android experience are the advantages for the Nokia 6. For some, the outdated hardware & low battery life can be a concern on an otherwise above average device. You have the Moto G5 Plus or Redmi Note 4 sits at a lower price but still has better hardware.